His mother was not wrong – as we know today, Tesla is the reason we have alternating current electricity. But, on top of that, starting in childhood, Tesla saw flashes of light that reportedly came to him before he had ideas. There’s another side of the story to the flashes of light that has emerged, however. It’s possible that these flashes – or visions – were actually caused by a traumatic event he witnessed in childhood. When Tesla was just five years old he saw his only brother, Dane, die in a horse riding accident. It was after this that Tesla began having the flashes of lights and visions. He had them for the rest of his life. The family lived in a modest home, one that has since been rebuilt complete with a statue of Tesla in the yard. 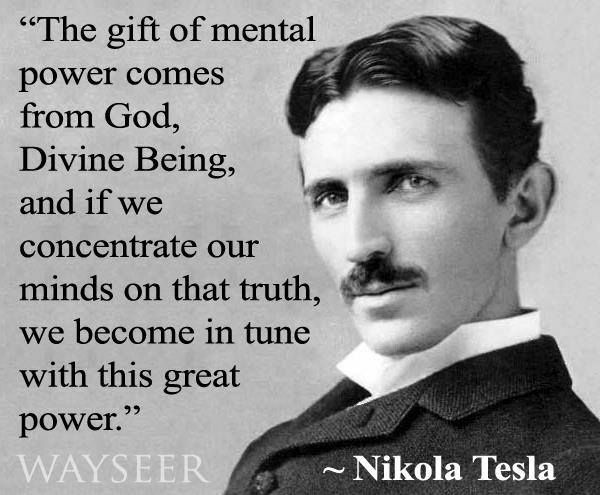 Tesla’s father was an Eastern Orthodox minister, and his mother was a brilliant woman who was an inventor herself. She created mechanical appliances to use around the house, and her tinkering and creative thinking undoubtedly influenced her son. Tesla’s mother also had an incredible memory. She could memorize entire epic poems, and Tesla credited his own photographic memory to the genes he inherited from his mother. He memorized entire books, visualized his projects and ideas, and spoke several languages. In his early years at school, Tesla’s studies focused on German, math, and religion. By the time he entered the later years of his education science had become a key focus. He moved away from his family to attend the Higher Real Gymnasium. Here, Tesla was accused of cheating because of his photographic memory. His outstanding memory allowed him to perform integral calculus using only his mind – no pen or paper required – and so his teachers became suspicious. Nonetheless, Tesla was able to finish the necessary work to graduate in only three years instead of the customary four. During his three years at the Higher Real Gymnasium, Tesla was introduced to a phenomenon that ultimately defined his career and how he’s remembered today. In his physics class, the teacher demonstrated electricity. Tesla was fascinated. But it would be some time before he could launch a career studying and using electricity. He became ill shortly after graduating in 1873. For nine months, he was bedridden with cholera and only narrowly escaped death. His brush with death helped form Tesla’s lifelong germaphobe tendencies…he was so fearful of germs that it took him 18 napkins to get through a single meal. In 1874, Tesla was expected to be conscripted into the military. Tesla had no interest in serving, and managed to escape from the requirement by running away to a mountainous region where he was able to disguise himself as a hunter. After a year, Tesla was able to emerge from the mountains and start seriously studying science. He began attending classes at Austria Polytechnic, where he quickly showed himself to be both a talented and diligent student. In fact – he may have been too diligent. Years after he left the school, and after his father had died, Tesla discovered a pile of letters that the school sent to his father warning them that Tesla was overworking himself. According to Tesla himself, he was working incredibly hard – getting up at 3 AM, and not going to bed until 11 PM. During that time, he was fully focused on his studies. He didn’t even take off holidays or Sundays from this routine. By the time his first year was over, he had passed twice as many exams as he needed to and received the highest grades possible. But even someone with a brain like Tesla’s couldn’t sustain that kind of schedule. His second year in school was a complete reversal from his first. After losing a scholarship at the end of his second year, Tesla began gambling. Gambling wasn’t just a pastime for him – he was addicted to it. He lost his tuition money gambling, and then when final exams rolled around he was unprepared to take them. He never did take them…and so he never graduated. Unwilling to face his family and tell them he did not graduate, Tesla simply fled to the town of Maribor and took up work as a draftsman. He started gambling again, playing cards on the street. At first, some of Tesla’s friends thought he had drowned, but Tesla’s father figured out the truth eventually. He tried to get his son to return home, but Tesla refused. Eventually, he was forced to return home when he was arrested for not having a residence permit. For a year, Tesla worked as a teacher in Gospic, the town where his family lived. But his extended family wanted to help him get back to school…so they pooled their funds and off to Prague he went. But it wasn’t an easy jump back into academia. He arrived too late to actually enroll. And even if he hadn’t been late, Tesla was missing some of the key studies required to enroll. Namely, Czech and Greek. So he did not achieve his academic dreams, but by 1881 Tesla was able to find work in his preferred field. He had found a job as an electrical engineer with the Central Telephone Company in Budapest. While working there, he and a friend had a habit of walking through the park. One day during the walk, Tesla got one of his visions – he knew how to build an induction motor. He picked up a stick, found a patch of dirt, and sketched out his idea there and then. He then built a prototype of the motor. It made sense to him, and he knew the importance of it, but he couldn’t drum up much interest for his invention in Europe. While Tesla was working in Europe, Thomas Edison had launched his Edison Company – which included a branch in Paris. Tesla secured a job at the Continental Edison Company helping with the installation of lighting in Paris. His talents were soon taken advantage of for design and for troubleshooting. 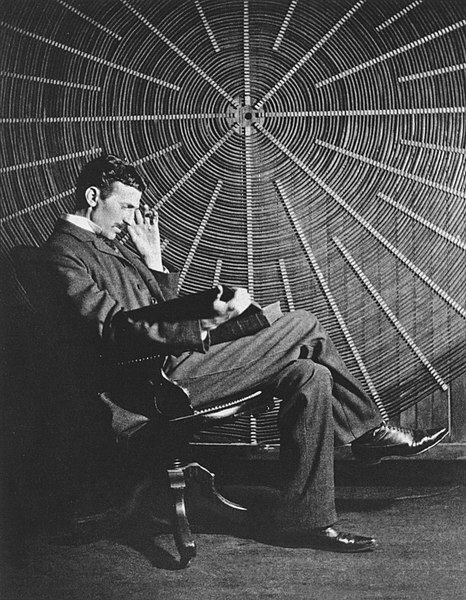 Nikola Tesla, with Rudjer Boscovich’s book “Theoria Philosophiae Naturalis”, in front of the spiral coil of his high-voltage Tesla coil transformer at his East Houston St., New York, laboratory. And within two years, he was recruited to travel to America to work for Edison directly in New York. He and hundreds of others worked in Manhattan, installing lights and building out an electric utility for New York City. But as he had in his first year of school, Tesla was also a non-stop worker. One story relates that he stayed out all night working, and took some gibes from people for being out all night. When Edison found out he was actually out working, Tesla earned Edison’s respect. Working for Edison wasn’t ideal for Tesla, though. He only lasted six months at the company. Edison and Tesla disagreed over the alternating current and the direct current, with Tesla favoring alternating and Edison favoring direct, but it’s still unclear if that disagreement was the primary reason Tesla ended up leaving the company. Tesla and Edison also differed in their approaches to business and science – Edison was attuned to the marketing side of things, while Tesla was highly focused on the scientific invention and innovation part of the work. It’s possible his leaving may have been precipitated by a bonus he thought he was getting…and was then refused. The manager at the Edison Company challenged employees to design two dozen different machines. The first person to successfully do so would receive a huge bonus – fifty thousand dollars! That translates to millions of dollars by today’s standards. Regardless of the reason, the fact is that Tesla departed from Edison’s company after only a few short months. He had it in his mind that he was going to start his own company, researching and working with alternating currents. It wasn’t so easy to just get started, though. When Tesla quit Edison’s company, he had to earn money to live on by digging ditches for only two dollars a day. “My high education in various branches of science, mechanics and literature seemed to me like a mockery,” he said of this time. While he was doing that, though, he was pitching investors. He found people who liked what they heard, and trusted the scientific knowledge of this young immigrant. 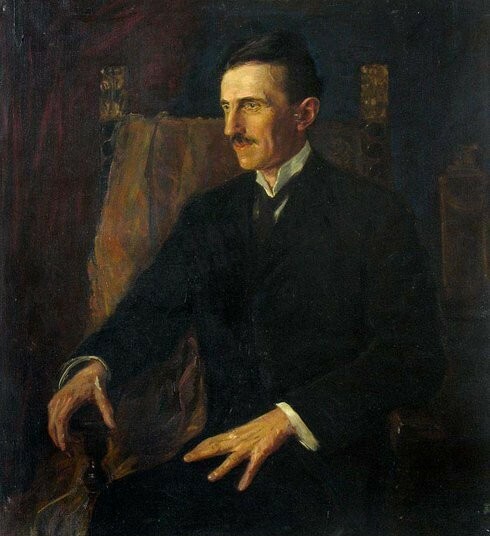 Blue Portrait of Nikola Tesla, the only painting Tesla posed for. By 1885, he was working on getting his arc lighting system patented and had a funding promise from two businessmen to start Tesla Electric Light and Manufacturing. Only a year into the venture, though, they pulled out and left Tesla in the lurch. Yet again, the inventor was penniless. In 1886, though, he met two men who were looking to invest in scientific inventions. They set Tesla up with a laboratory in New York City, established a profit-sharing structure, and the Tesla Electric Company was born. In only a year, Tesla had created an induction motor that ran on alternating current. This time, he had two business partners who were ready and willing to handle the marketing and business end of things. Soon after, Tesla published a paper entitled: “A New System of Alternating Current Motors and Transformers.” It laid out his ideas, and it got him noticed. George Westinghouse read the paper, and he liked what he read. 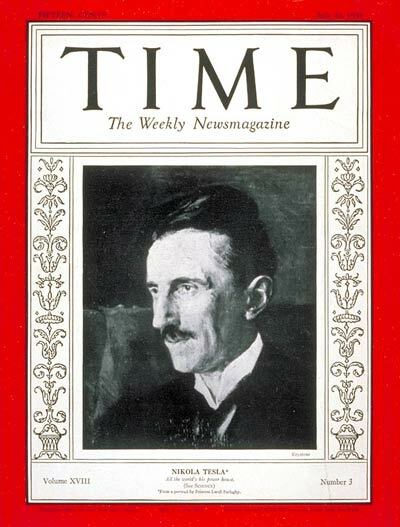 Westinghouse licensed Tesla’s induction motor, and also gave him a consulting job at the Westinghouse Electric and Manufacturing Lab in Pittsburgh. Westinghouse wanted to be the person who provided the United States with long distance power, and he believed Tesla was the person to help him achieve his goal. In the early 1890s, Westinghouse and Edison were competing heavily in the electric industry. Edison was throwing out claims that Tesla’s AC current wasn’t safe, and meanwhile Westinghouse was facing financial difficulties. But Westinghouse paid Tesla for the licensing, and so he had the ability to continue working on projects that he wanted to. One of those projects was the Tesla coil. 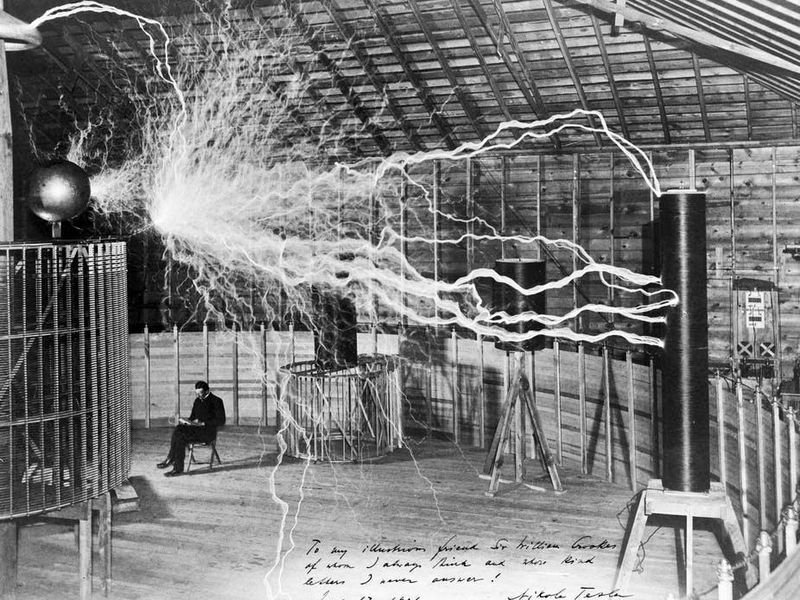 The Tesla Coil, which he patented in 1891, allowed electricity to be transmitted wirelessly. It was the first invention of its kind, and it was used in antennas, used to send telegraphs, and even though the original design isn’t used anymore, a different version of it is still used in tv and radio to this day. 1891 was a landmark year in Tesla’s life for another reason, too. Along with the patent for the Tesla Coil, he was also granted U.S. citizenship. Tesla continued his relationship with Westinghouse into the 1890s, as they sought out his help for the 1893 Columbian Exposition in Chicago. Westinghouse was in charge of lighting the entire event, but also had its own display. Here, he gave demonstrations to the public, showing how an AC current worked. Tesla’s next major project came at Niagara falls. Power was being generated at the falls, but there was a need for an efficient transmission system. Based on Tesla’s recommendation, Westinghouse was hired to build an AC generation system at Niagara. Tesla did the design work, and the resulting hydroelectric power plant began providing electricity to the city of Buffalo, New York. With all of these projects, Tesla was gaining visibility both in American and around the world. And he was getting to know other high profile people, too. Not all of them were in the scientific sphere, either. One of the American celebrities that Tesla got to know was Mark Twain. Even when he was living in Croatia, Tesla was reading Twain’s books. The two met in New York City, having crossed paths at a social event. Twain had always been interested in technological innovation, and so the two spent much time together in Tesla’s lab. A photograph of Twain’s hand that Tesla took using light from “Crookes Tubes” brought Tesla right to the edge of discovering x-rays…unfortunately he didn’t realize how close he had come until x-rays were actually discovered and the use of crookes tubes in the invention was made known. Twain was also a part of another Tesla experiment…an experiment specifically designed to address Twain’s digestive issues. Twain was often constipated, and he wasn’t shy about complaining of the condition. Tesla had developed a vibrating disk that would essentially shake whoever stood on top of it. He urged his author friend to climb on board the device, and literally have his digestion issues solved by shaking his bowels loose. When Tesla thought Twain had had enough of the shaking treatment, he told him to get off. But Twain didn’t want to get off. He stayed on top of the disk, and continued to be shaken, ignoring Tesla’s urgings. He shouldn’t have ignored Tesla – eventually the shaking did its job, and then some, on Twain’s bowels. He couldn’t control them. The famous author had quite literally gone to the bathroom in his suit in the middle of Nikola Tesla’s laboratory. Tesla never stopped inventing. He said that he only slept two hours per night, and he was always looking for the next project. Wireless transmission of electricity was one of his main goals, but he needed funding to achieve it. Living in New York, he had ample access to wealthy people. He was able to convince J. Pierpont Morgan of the viability of wireless transmission, and the banker provided him with one hundred fifty thousand dollars to build a transmission tower. He was competing with Marconi to transmit wireless messages, but Marconi got there first. Investors, including Morgan, pulled their funds from Tesla’s project and he was forced to abandon the effort in 1906. When the project was abandoned, Tesla didn’t just have to stop construction – he had to actually mortgage the property. Tesla owed huge amounts of money to the Waldorf Astoria. He lived at the lavish hotel, and he lived large – spending twenty thousand dollars – that’s nearly five hundred thousand today – in the short time he lived there. In 1917, the transmission tower was demolished after Tesla lost it in foreclosure. He also tried to sue Marconi, asserting that he had stolen Tesla’s ideas to create his wireless transmission technology. Tesla put some of his social and nurturing energy that he wasn’t putting towards women towards the pigeons that flocked throughout New York City. And one in particular caught his attention. When that pigeon was hurt, Tesla invented a device to help heal its injured wing and leg. 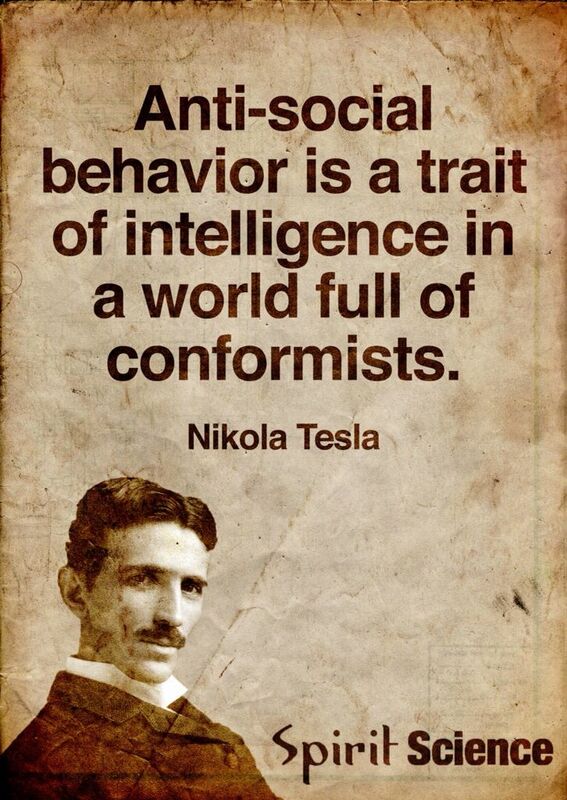 Tesla lived out his life in New York City, never married, but surrounded by the famous and the intellectual. He invented constantly, right up through the 1930s when he was well into his seventies. In January 1943, a maid decided to enter Tesla’s hotel room even though he had put up a Do Not Disturb sign. It had been up for 48 hours…when the maid opened the door, she was confronted with the sight of the famous inventor’s body. He died of coronary thrombosis at 86 years old. Behind him, Tesla left a legacy of invention, innovation, and scientific exploration. He played a crucial role in the spread of electricity and the creation of devices that led to the technology we have today.